OLM students are provided with several opportunities to exhibit and hone their leadership skills both in the classroom and in an extracurricular setting. These programs serve to not only enrich their educational and social experience while at OLM, but they also open doors that may lead to further opportunities once they graduate from OLM and explore their extracurricular options in high school and beyond. 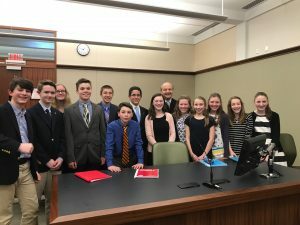 The OLM Mock Trial program, which has been in place for the past 10 years, is one such opportunity, open to students in Grades 6-8. Sponsored by the RI Bar Association and the RI Legal/Educational Partnership, the students are given a tremendous opportunity to delve into the world of the judiciary system while also exploring their interest in public speaking. Under the guidance of attorneys/parent volunteers and Middle School Social Studies Teacher Bethany Bessette, students form teams and assume the roles of attorneys and witnesses in a given case. The students prepare both the plaintiff’s and defendant’s cases and participate in a state-wide tournament against teams from other schools across the state. The trials generally take place in courtrooms at either the Noel Judicial Complex in Warwick or the Garrahy Complex in Providence. Members of the Rhode Island judiciary preside over tournament trials and attorneys act as performance judges. Program partners include the Rhode Island Bar Foundation, the Rhode Island Supreme Court, Rhode Island Department of Elementary and Secondary Education and RSVP. Many OLM grads who have gotten their start at in the mock trial program in middle school have gone on to achieve tremendous success in Mock Trial programs in high school and even at the college level!